Mantis is a fictional superheroine appearing in American comic books published by Marvel Comics. The character is a former member of the Avengers. Mantis made her cinematic debut in Guardians of the Galaxy Vol. 2, portrayed by Pom Klementieff. Klementieff reprised the role in Avengers: Infinity War. Mantis first appeared in The Avengers #112 (June 1973), drawn by Don Heck and created by writer Steve Englehart. After leaving Marvel Comics, writer Steve Englehart carried Mantis' tale through three other companies before returning to Marvel, moving from Marvel to DC to Eclipse to Image and finally back to Marvel again. In DC Comics' Justice League of America #142, she appears as Willow. Asked where she came from, Willow replies, "This one has come from a place she must not name, to reach a place no man must know." (Mantis refers to herself in the third person as "this one") After two issues, she leaves to go give birth. In the Eclipse Comics series Scorpio Rose #2 (according to Englehart's website ), the character calls herself Lorelei. By this time, she has given birth to a son. What would have been issue #3, a "lost" Lorelei/Scorpio Rose story, was later published in Coyote Collection #1 from Image Comics, the character's fourth company. Lorelei is later name-dropped in Englehart's 2010 novel The Long Man (page 355, mass market paperback edition). Mantis is the half-Vietnamese, half-German daughter of Gustav Brandt—Libra—and was born in Huế, Vietnam. In her childhood, her father leaves her in Vietnam at the Temple of the alien Priests of Pama, a sect of the Kree. The Kree believe she might become the Celestial Madonna and mate with the eldest Cotati on Earth to become the mother of the Celestial Messiah, "the most important being in the universe". She excels in her martial arts studies, but when she reaches adulthood, she is mind-wiped and sent into the world to gain life experience. She becomes a prostitute and barmaid in a Vietnamese bar, where she meets the Swordsman. She helps him regain his self-respect and follows him when the former villain attempts to rejoin the Avengers. She becomes an Avengers ally when the Swordsman rejoins the Avengers, and she battled the Lion God alongside them. With the Avengers, Mantis has many adventures. She battles the original Zodiac, and learns that Libra is her father and that she was raised by the Priests of Pama. She encounters the Star-Stalker, battles Thanos, Klaw and Solarr, Nuklo, and then alongside the Avengers, Fantastic Four, and Inhumans, she faces Ultron at the wedding of Quicksilver and Crystal. Mantis becomes taken with the Vision, and—although rejected by the android—neglects the Swordsman. Alongside the Scarlet Witch and Agatha Harkness, she was abducted by Kang. She was revealed as the Celestial Madonna and witnessed the death of the Swordsman at the hands of Kang, only realizing the depth of her love for the Swordsman just as he dies. She then buried the Swordsman, and battled the Titanic Three. She would learn the origins of the Kree-Skrull War, the Cotati, and the Priests of Pama. Mantis then formally joined the Avengers and is revealed to be, indeed, the Celestial Madonna and marries a Cotati in the reanimated body of the Swordsman, leaving the Avengers and the Earth to mate with him. The fragments arrive on Earth and one version of Mantis rejoins the West Coast Avengers team, with portions of her memories missing. [volume & issue needed] (Steve Englehart intended the storyline involving Mantis and her amnesia to be his next major plotline, but editorial problems caused him to quit the series, with the plotline resolved hastily.) Mantis discovers, through the temporarily resurrected corpse of the Swordsman, that her psyche had shattered and that she needs to find her counterparts in order to restore her memories. [volume & issue needed] She made her way to New York City where she encountered the Fantastic Four as they dealt with the effects of the Inferno storyline. Kang pursued Mantis, not realizing she had lost her power and hoping to use her to attack the Dreaming Celestial, and in the process the Surfer was summoned to Earth. With the aid of the Cotati, Kang was defeated but Mantis realized she must leave her body and join with the Cotati to raise her son. Mantis in action, taking on a larger, stronger foe with characteristic bravado and self-narration. Art by Sal Buscema and Joe Staton. 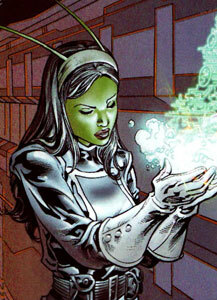 Mantis appears in the 2007 miniseries Annihilation Conquest: Star-Lord, where she is shown as a Kree prisoner who volunteers for a mission led by Peter Quill, a.k.a. Star-Lord. After the defeat of Ultron and the Phalanx, Mantis takes up residence on the Knowhere station with the rest of the Guardians of the Galaxy. She has assumed the role of counselor for the group, using her knowledge of the mind to maintain a balance with all the very eclectic personalities of the group. During the Secret Invasion storyline, it was discovered that Star-Lord had Mantis use her mental powers to manipulate the members of the Guardians of the Galaxy to join the team against their will. Overhearing Mantis and Star-Lord converse about their deception, Drax shared this knowledge with the rest of the team. This caused most of the members to leave. Mantis was promoted to field status by Rocket Raccoon. Mantis later rescues Peter Quill from a group of pursuing Spartax soldiers. Though she refuses to join his new incarnation of the Guardians, she helps him track down the source of mysterious "time quakes" that have been plaguing him in the wake of the Age of Ultron storyline. The character was ranked 99th in Comics Buyer's Guide's "100 Sexiest Women in Comics" list. She has attained a mastery of meditational disciplines, giving her an unusual amount of control over her body, including autonomic functions like heartbeat, bleeding, and breathing, as well as awareness of pain, allowing her to more quickly heal injuries through sheer force of will, and affording almost superhuman reflexes and reactions. She also had psychic empathy, a telepathic power that allowed her to sense the emotions of others. Mantis gained additional abilities as a result of communion with the Prime Cotati. Her empathic ability enabled her to communicate with the plant-like Cotati and with plant life. To travel in space, Mantis had the ability to separate her physical and astral forms, projecting her consciousness from her body, allowing her to travel interplanetary distances. She also had the ability to transfer her astral form to any place where plant life exists. She could form and inhabit a plant like simulacrum of her human body for herself out of the destination planet's local vegetation. Her fighting skills remained intact, and her empathic abilities were heightened to a superhuman degree and extended to the planet’s flora and biosphere. She could control the vegetation within her vicinity. During her confrontations with a powerful Thanos clone, she displayed superhuman strength, a talent to simultaneously inhabit multiple simulacra, and the ability to project strong blasts of energy, but has not been seen using these powers since. As of her appearance in Annihilation Conquest: Star-Lord, Mantis also appears to have gained telepathic and precognitive abilities, and apparently now labors under a constant awareness of future events. [volume & issue needed] The source of these new powers is as yet unclear. Other powers displayed or referred to during the series were pyrokinesis, mid-range mentat training, and invisibility to the Phalanx. In the Heroes Reborn reality, the alternate version of Mantis is the woman Kang the Conqueror loves, and Kang's motive to attack the 20th Century and the Avengers is to show that he is worthy of her love. Mantis recognizes her love for Kang after he is killed by Loki, who kills her shortly after. In this reality, Mantis is a member of Shang-Chi's Dragons criminal organization, alongside, Swordsman, Zaran, and Machete. Mantis is arrested after the Dragons are ambushed by the Kingpin's assassins. She and Shang-Chi are two of the three survivors of the group. Mantis appears in the Guardians of the Galaxy animated series, voiced by Jennifer Hale. This version is a member of the Universal Believers. In the episode "Don't Stop Believin'", Gamora, Drax the Destroyer, Rocket Raccoon, and Groot encounter Mantis where she takes them through the tunnels beneath the Spartaxian Royal Palace in order to save Star-Lord. They go through various obstacles where Mantis tells them to believe. After the group frees Star-Lord, they end up in the throne room where the Cosmic Seed energy is even after a fight with the robots there and a brief fight with Emperor J'son. When Mantis claims that J'son is a tyrant, she tries to attack him only to be subdued by the Guardians. While being remanded to the dungeon, Mantis still claims that J'son is a tyrant and that they will eventually believe that fact. In the episode "Lyin' Eyes," Mantis had escaped from the Spartaxian Dungeon and has joined her cult, the Universal Believers's fellow members in a criminal only auction house on Knowhere. While accessing the vault in Knowhere's Sinus Cavity to look for the Pocket Dimension Vial, Rocket Raccoon and Drax run into Mantis who has gained Ebony Maw of the Black Order as the latest member of the Universal Believers. They defeat Rocket and Drax, then have the Blood Brothers dispose of them on a nearby planet. Upon the two of them being rescued by Star-Lord, Gamora, and Groot, Rocket and Drax confront Mantis and the rest of the Universal Believers on their flagship that was orbiting another planet. They used a device which converts mental energy into physical energy to aid them in combat. With the help of Rocket's lies, the Guardians cause doubt in the cult's belief and thus removes their powers allowing them to defeat Mantis, Ebony Maw, and the rest of the Universal Believers fanatics. In the episode "Black Helmet Women," Mantis and the Universal Believers were able to steal the sarcophagus from the Guardians. During a fight on the Universal Flagship, Gamora in the Nova Centurion helmet managed to damage the Universal Believers' ship and the Guardians make off with the sarcophagus as Mantis and the Universal Believers work to recharge their flagship's engines. In the episode "Me and You and a Dog Named Cosmo," Mantis and Ebony Maw drain Cosmo the Spacedog's energies as part of their plans to disrupt the Rigellian Peace Conference on Nowhere. The Guardians managed to cause their flagship to crash into Knowhere's cranium. In the episode "Can't Get It Out of My Head," Mantis and the Universal Believers use the advantage of their crashed flagship to turn Knowhere's inhabitants into zombies that obey the Universal Believer's orders where the zombies build a weapon that they will use on Xandar and the sarcophagus. When their plot is thwarted, the Universal Believers' flagship drifts towards Xandar. In the episode "Rock Your Baby," Mantis, Ebony Maw, and the Universal Believers confront the Guardians and Cosmo when the sarcophagus hatches into a Warlock. With help from Cosmo and Warlock's evolving powers, the Guardians get away from the Universal Believers. In the episode "Back in Black," it was revealed that Mantis and the Universal Believers had been imprisoned in a secret lab that was run by J'son where is the Universal Believers' patriarch. Upon drawing Sam Alexander to Spartax, she manipulates events that lead to him freeing J'son. In the episode "Knights in Black Helmets," Mantis and J'son take Sam Alexander to a Xandarian spaceship that was in the stomach of a space whale. When it comes to the room where the Nova Centurian Helmets are, Mantis believes she has obtained a true one. When she tries it on, she is turned to stone, then crumbles into dust. Pom Klementieff portrays Mantis in Marvel Cinematic Universe. The character first appears in Guardians of the Galaxy Vol. 2. Mantis is introduced as a ward of Peter Quill's father, Ego, using her empathic abilities to help him sleep when travelling in his human form, although she is also able to sense and influence other emotions when she makes contact with the subject. She is depicted as somewhat innocent and naïve, showing no offense when Drax refers to her as Ego's pet or refers to her as being hideous, but swiftly decides to aid the Guardians against Ego when she realizes that Peter's ability to channel Celestial energy will help Ego achieve his goal of 'awakening' other planets from the seeds he has planted in his travels. As the Guardians try to destroy Ego, Mantis is able to buy them time by travelling down to Ego's core and forcing him to sleep while Groot plants a bomb in his brain even though she is knocked unconscious by the debris of the Sovereign ships. At the film's conclusion, Mantis joins the Guardians. Mantis appears in Avengers: Infinity War. Her empathic abilities are used to briefly disable Thanos, but at the film's conclusion Mantis is one of the victims of Thanos's destruction of half the life in the universe. Mantis appears in the Guardians of the Galaxy – Mission: Breakout! attraction at Disney California Adventure. Her picture can be seen on a wanted poster in the attraction line, and she is later seen aiding the Guardians in their escape from the Collector's fortress. Mantis is portrayed by Pom Klementieff, reprising her role from Guardians of the Galaxy Vol. 2. Mantis is a playable character in Guardians of the Galaxy: The Universal Weapon. Mantis is a playable character in Lego Marvel's Avengers, voiced by Ali Hillis. Mantis is a playable character in Marvel Future Fight. Mantis is a playable character in Marvel: Avengers Alliance. Mantis is a recruitable character in Marvel Avengers Academy. Mantis appears in Guardians of the Galaxy: The Telltale Series, voiced by Sumalee Montano. She first appears in episode 3, when Star-Lord and Gamora free her from her casket on Emnios. Afterwards, she tells the Guardians of the Galaxy the truth about the Eternity Forge. ^ "DOING COMICS THE STAINLESS STEVE ENGLEHART WAY:". angelfire.com. ^ "Comic Book Urban Legends Revealed #16! - Page 3 of 3 – Comics Should Be Good @ CBR". Comics Should Be Good @ CBR. Archived from the original on 2016-05-10. ^ Avengers: The Complete Celestial Madonna Saga. [Mantis] often referred to herself in the third person as "this one"
^ Frankenhoff, Brent (2011). Comics Buyer's Guide Presents: 100 Sexiest Women in Comics. Krause Publications. p. 61. ISBN 1-4402-2988-0. ^ Marvel Entertainment (10 March 2016). "Marvel's Guardians of the Galaxy Season 1, Ep. 15 - Clip 1". Retrieved 15 May 2017 – via YouTube. ^ Yee, Lawrence (May 26, 2017). "'Guardians of the Galaxy' Cast Celebrate Opening of New Disney Attraction". Variety. Retrieved December 30, 2017. ^ "MARVEL Future Fight - mobirum". Retrieved 15 May 2017. ^ Ben Morse (June 21, 2016). "GO INSIDE AVENGERS ALLIANCE: SPEC OP 35". Marvel. Retrieved June 1, 2017.